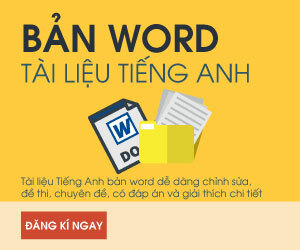 Cập nhật đề thi thử mới từ các trường THPT năm 2019 môn Tiếng Anh, Thích Tiếng Anh gửi tới bạn đề thi thử Tiếng Anh trường Chuyên ĐH Vinh năm 2019 tổ chức lần 2 có đáp án 50 câu hỏi trắc nghiệm. from the other three in pronunciation in each of the following questions. Mark the letter A, B, C or D on your answer sheet to indicate the word that differs from the other three in the position of primary stress in each of the following questions. Question 5: The only structure remaining intact is the Flag Tower of HaNoi built in 1812 during the Nguyen Dynasty. Question 6: Music plays a crucial role in our live, therefore all too often is taken for granted. Question 7: Solar energy can also be used for day light, cooking, heating and helping plants grow. Mark the letter A, B, C or D on your answer sheet to indicate the word(s) OPPOSITE in meaning to the underlined word(s) in each of the following questions. Question 8: Mail shots have proved to be the most cost-effective method of marketing our products. Question 9: She now faces the daunting challenge of writing a successful sequel to her hugely popular first book.